Malthus, Thomas Robert (b. Feb. 14/17, 1766, Rookery, near Dorking, Surrey, Eng.--d. Dec. 23, 1834, St. Catherine, near Bath, Somerset), English economist and demographer, best known for his theory that population growth will always tend to outrun the food supply and that betterment of the lot of mankind is impossible without stern limits on reproduction. 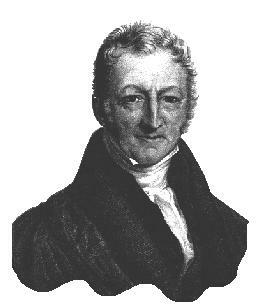 Malthus was of a prosperous family. His father, a personal friend of the philosopher and skeptic David Hume, was an ardent disciple of Jean-Jacques Rousseau, whose book mile may have been the source of the elder Malthus' liberal ideas about educating his son. The young Malthus was educated largely at home until his admission to Jesus College, Cambridge, in 1784. There he studied a wide range of subjects and took prizes in Latin and Greek, graduating in 1788. He took his master of arts degree in 1791, was elected a fellow of Jesus College in 1793, and took holy orders in 1797. He wrote a pamphlet in 1796 called "The Crisis" (not published), which, among other things, took a favourable view of newly proposed poor laws, which were to set up workhouses for the poor. This was a view that ran somewhat counter to his views on poverty and population published two years later. The opinions and teachings that Malthus developed reflect largely a reaction, amiably conducted, to his father's views and to the doctrines of the French Revolution and its supporters. The English radical philosopher William Godwin, for example, was being widely read for such works as Political Justice (1793), which took for granted the perfectibility of mankind and foresaw a millennium in which rational men would live prosperously and harmoniously without laws and institutions. Unlike Godwin (or, earlier, Rousseau), who viewed human affairs from a theoretical standpoint, Malthus was essentially an empiricist, and he began from the harsh realities of his time. His reaction developed in the tradition of British economics, which would today be called sociological. In 1798 he published anonymously the first edition of An Essay on the Principle of Population as it affects the Future Improvement of Society, with Remarks on the Speculations of Mr. Godwin, M. Condorcet, and other Writers. The work received wide notice. Briefly, crudely, yet strikingly, Malthus argued that infinite human hopes for social happiness must be vain, for population will always tend to outrun the growth of production. The increase of population will take place, if unchecked, in a geometrical progression, while the means of subsistence will increase in only an arithmetical progression. Population will always expand to the limit of subsistence and will be held there by famine, war, and ill health. "Vice" (which included, for Malthus, contraception), "misery," and "self-restraint" alone could check this excessive growth. Malthus was an economic pessimist, viewing poverty as man's inescapable lot. The argument in this first edition is essentially abstract and analytical. After further reading and travels in Europe, Malthus produced a subsequent edition (1803), expanding the long pamphlet of 1798 into a longer book, and adding much factual material and illustration to his thesis. At no point, even up to the final and massive sixth edition of 1826, did he ever adequately set out his premises or examine their logical status. Nor did he handle his factual and statistical materials with much critical or statistical rigour, even though during his lifetime the sophistication of statisticians was developing remarkably in both continental Europe and Great Britain. A remark by Kingsley Davis, a United States student of population, that Malthus' theories, apparently founded on so extensive an empirical base, are yet at their weakest with respect to empiricism and at their strongest as a tight and elegant theoretical formulation, has much truth in it as both praise and blame. For better or worse, the Malthusian theory of population was, nevertheless, incorporated into current theoretical systems of economics. It acted as a brake on economic optimism, helped to justify a theory of wages that made the minimum cost of subsistence of the wage earner a standard of judgment, and discouraged traditional forms of charity. The immediate influence of the Malthusian theory of population on social policy was very great. It had been believed that fertility itself added to national wealth; the poor laws perhaps encouraged large families by their doles. If they had "never existed," wrote Malthus, "though there might have been a few more instances of severe distress, the aggregate mass of happiness among the common people would have been much greater than it is at present." These laws limited the mobility of labour, he said, and encouraged fecundity and should be abolished. For the most unfortunate it might be licit to establish workhouses, not "comfortable asylums," but they should be places in which "fare should be hard" and "severe distress . . . find some alleviation." In 1804 Malthus married Harriet Eckersall and in 1805 became professor of history and political economy at the East India Company's college at Haileybury, Hertfordshire. It was the first time in Great Britain that the words political economy had been used to designate an academic office. He lived quietly at Haileybury for the remainder of his life, except for a visit to Ireland in 1817 and a trip to the Continent in 1825, for health reasons. In 1811 he met and became close friends with the economist David Ricardo. Meanwhile, he continued publishing a variety of pamphlets and tracts on economics. In them he approached the problem of what determines price with a less rigorous analysis than Ricardo and in terms of an institutionally determined "effective demand," a phrase that he invented. In 1820 in his summary Principles of Political Economy Considered with a View to Their Practical Application, he went so far as to propose public works and private luxury investment, as palliatives for economic distress, that would increase effective demand and prosperity. He went further and criticized thrift as a virtue knowing no limit; to the contrary, he argued, "the principles of saving, pushed to excess, would destroy the motive to production." To maximize wealth, a nation had to balance "the power to produce and the will to consume." In fact, Malthus, as an economist concerned with what he called the problem of "gluts" or, as they would be called today, the problems of slump and depression, can be said to have anticipated the economic discoveries of John Maynard Keynes in the 1930s.